Our Welfare & Rescue exists to help Maus, who, for whatever reason need to find a new home. This may be because of a marriage break-up, someone moving to a new home unsuitable for cats, a change in family circumstances or, thankfully very rarely, because the cat is not cared for. of those people who would like to offer a home to an older cat and when a Mau is available that may be suitable for their circumstances, will make contact. Fortunately, not many Egyptian Maus need re-homing, so you will need to be patient until the right Mau for you comes along! How do we know whether you would be the right person for a Mau? If you have indicated you are interested in providing a loving home for an older Mau that is in need, we would arrange a home visit to see the environment offered. You would be required to sign an "adoption" form, indicating you will keep up with things like annual vaccinations and would be prepared to seek veterinary advice if the cat were sick etc. Some Maus would require an indoor life, others allowed out into the garden. We would try and match situations as far as possible. It would be traumatic for a Mau that has had the run of a garden to be kept indoors all the time and vice versa. We do ask though that all Maus are safely indoors at night and have access to a litter tray. We would also ask for a donation to the Egyptian Mau Club Welfare Fund. What qualities do we look for in a potential new owner? First and foremost a vast fund of patience and loving care to reassure a Mau that the new home is a safe and secure environment where he or she will receive attention and affection. A Mau is naturally a "people orientated" cat and will respond so well to your care, you will have an intelligent companion who is also a very beautiful cat. 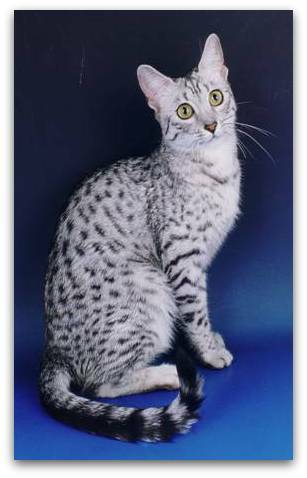 We are also here to help with any queries or problems you may have with your Egyptian Mau. Contact any member of the committee and we will do our best to solve the situation or answer your question. Please donate to help the welfare of Egyptian Mau Cats.